This year join the Peace Corps community nationwide and celebrate the Peace Corps’ 49th anniversary with a third goal activity! Honor Volunteers of past and present and your host countries by bringing the world home. You can do this through a variety of ways such as organizing a cultural event, presenting an exhibit of photographs or crafts, or visiting a classroom. 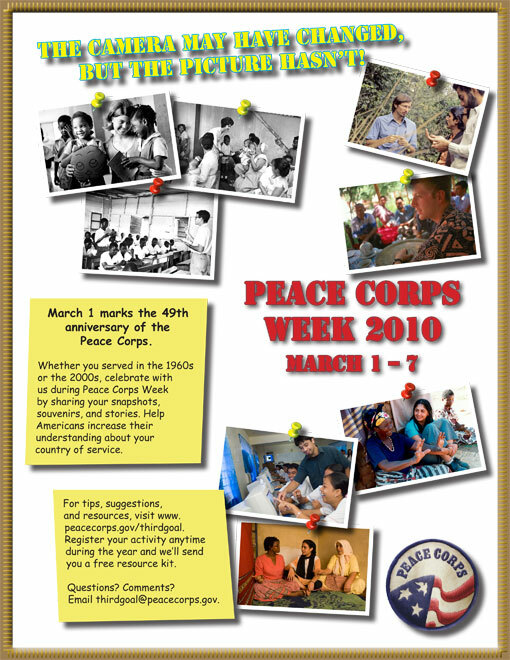 Don’t forget to register your third goal participation at http://www.peacecorps.gov/wws/speakersmatch/! This is the only means we have to demonstrate the impact of third goal events to Congress.